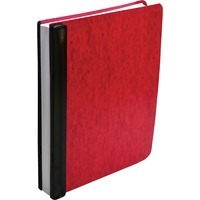 An efficient organizational tool, this letter size data binder expands to hold up to 6 of information and features a spine label for titling contents. Retractable storage hooks and carrying handle add versatility of use. Pressboard covers are made of durable 60% recycled content. Blue or red.